Peaches are another reason why I love summer. It’s one of several fruits I look forward to all year long. So juicy, sweet, tasty…yum. I bought a bunch of them recently and tossed around the idea of making a cobbler…a galette…a crisp…but something was pulling me toward the ice cream maker again. A compelling force that’s been keeping my freezer stocked with delicious flavors since I got my gadget just weeks ago. A power no one can deny. Make this before peaches go away for the year! In a large bowl, mix together eggs and sugar until smooth. Puree peaches in food processor and stir puree into egg mixture. Stir in cream, half and half, vanilla and salt. Mix well. Pour mixture into freezer canister of ice cream maker and freeze according to manufacturer’s instructions. This entry was posted in dessert, freezer friendly, ice cream. Bookmark the permalink. Homemade ice cream is one of my favorite things in the world. I indulged in it a lot when I traveled last month. Love this! Peaches are coming into season here and I’m so excited to try them in this recipe. It sounds wonderful. wow peach ice cream sounds so refreshing. Along with peaches I always look forward to nectarines in the summer. 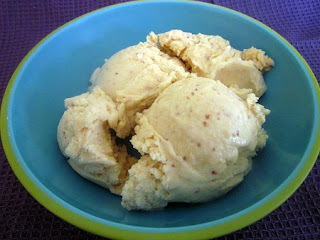 Peach ice cream sounds perfect for this summer heat. Looks delicious and now I feel like having a scoop or well, make that two! Thanks for stopping by my blog and being part of the giveaway! The peaches have been awesome and you are so lucky to have Jersey peaches! I feel that compelling force every time I go near the freezer! It’s time to actually do something about it. Love that this ice cream celebrates fresh peaches. Yum! Peach ice cream sounds good. Well done!